Hi, friends! It dawned on me recently that I have never put together a ‘makeup kit for beginners’ type of post. So, that is exactly what we’re doing today! Since I’ve been wearing makeup since I was around 15 years old and makeup has been such a big part of my life since then, it’s easy to forget that I was also once a beginner! I often hear from others that there is so much makeup out there to choose from that they don’t know what to buy. They get overwhelmed by just looking at everything. And I totally get it. We were all there at some point! Today, I’m going to make it easy for you. I’m going to outline a list of must-have products for your makeup kit and I’ll also include some products that are optional, but nice to have if you want the whole shebang. And I know that not everyone is obsessed with makeup like I am and cannot even imagine splurging on a high-end makeup product. If you’re one of those people, I have good news for you. You absolutely do not need to splurge on makeup to get great quality. There are so many amazing makeup products at the drugstore that are super affordable. You can put together an amazing makeup kit with products from the drugstore! And even if you never venture away from this list for the rest of your life, you’ll be set with these products. When creating this list, I focused on products that are easy to use and appropriate for everyday use. I figured that if you’re just beginning on your makeup journey, you’re probably not going to want to start wearing bright pink eyeshadow right away! So, with that in mind, this list will include products that are more on the natural and neutral side. I also stuck to products that would be easy to find in any drugstore. There are a lot of other affordable drugstore-esque brands that have amazing products but can be hard to find unless you go to an Ulta store or purchase online. Alright, that was a lot of words and I know you just want the list. In a nutshell, in this post, you’ll find a list of makeup products for beginners and basic makeup for beginners on a budget. 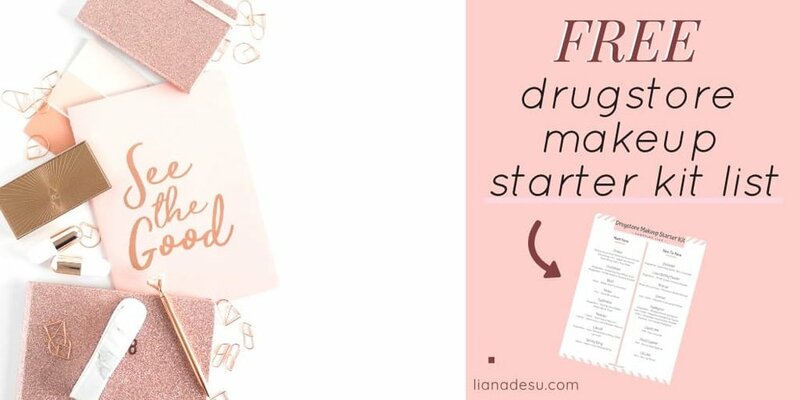 Let’s get your drugstore makeup kit started! You may have heard some people say that primer isn’t really necessary in your makeup routine, but I personally believe that primer is absolutely necessary! With the right primer, your skin will look smoother and healthier. Also, your foundation will apply more seamlessly and will last longer. This primer softens the look of fine lines and pores, while hydrating your skin and creating a healthy glow. It has an oil-free formula that feels lightweight on the skin and under foundation. This primer feels super silky to the touch and makes your skin look just as silky smooth! It minimizes shine and creates a flawless canvas for your foundation. I’ve noticed that when too much is applied, your skin can become too slippery of a base for your foundation to really ‘stick’ and will end up sliding around/separating. I would recommend using any kind of pore filler for just that purpose – to fill pores. And use a different type of primer on the rest of your face. Totally a dupe for the Benefit POREfessional Primer. There really are SO many different types of foundation out there so I know it can be really tough to choose one! For beginners, I would totally recommend a stick foundation because it’s easy to apply, it isn’t messy, and it’s easier than a liquid to start with just a small amount and add more in certain areas. It can also be used to spot conceal blemishes, so you don’t have to buy a separate concealer for that! I would consider this a medium-coverage foundation that can be built up to full-coverage. But, like I said above, you can start off with just a tiny amount and add more in certain areas, so it really can be any amount of coverage that you want it to be. Regarding building up coverage, you’ll have no problems with this foundation. It blends out beautifully without bunching up in areas. And for this exact reason, it works amazingly as a spot concealer – just add a bit on your blemish and lightly dab with your finger to blend it out. This foundation has a natural matte finish, which is another reason I chose it for this list. Because of its matte finish, it’s easier to work with for beginners. If you don’t know what kind of foundation finish you prefer yet, I would suggest always starting with matte. You can use the powder foundation to lightly set your cream/liquid foundation by applying it all over your face with a fluffy brush. Or, if there are days when you want something super lightweight that will still give you a hint of coverage, or you just aren’t feeling a cream/liquid foundation, but still want to make your skin look better, powder foundation is your answer. I often will use just this powder if I’m in a rush to get out of the house, but I still want a little coverage. Perfect for running a quick errand when you can’t be bothered to put on makeup! It’s also great to throw in your purse for quick touch-ups throughout the day. You may have noticed that I skipped over the rest of the face products. That’s because when I think back to when I was just starting to wear makeup, I didn’t use all of that stuff. BUT, I did always use blush. In my opinion, even if you don’t bronze and contour your face, adding a bit of blush makes you look so much more healthy and awake! This blush is perfect for beginners because it’s pigmented, without being too pigmented. And if you happen to apply too much of it, it’s really easy to blend and sheer out the color. Of course, you should choose a shade that you like the best and for me, that shade is Luminoso. It’s a peachy-pink shade with a hint of gold reflect for the perfect healthy glow! This is probably one of, if not the most, important aspect of any makeup routine! I absolutely will not step out of the house without my brows done. And not because my natural brows are bad, but when I shape and fill them in, they are just so much better. Having the right brow shape for your face can completely change your look! If you’ve never shaped and filled in your brows before, the best product would definitely be a pencil that makes it easy to create hair-like strokes. This retractable pencil has a super precise tip that makes it easy to lightly fill in your brows without going overboard. Also, it’s totally a dupe for the Anastasia Beverly Hills Brow Wiz. *Another option would be to use an angled brow brush and a brown eyeshadow to fill in your brows, if you don’t want to define and sculpt your brows. While it’s not absolutely necessary to wear eyeshadow every time you wear makeup, I think it’s totally necessary to have a solid palette in your makeup kit that you can turn to when you want to wear eyeshadow. If you’re new to wearing eyeshadow and aren’t ready to wear bright colors and glitter, go for something with neutral matte shades that you can create an entire look with. This is a great starter palette because it’s small, it’s comprised of all neutral matte shades, and it’s appropriate for everyday wear. This palette has all the necessary shades to create an entire eye look – crease shades, outer corner shades, and lid shades. I know I said earlier that brows are the most important aspect of a makeup routine, but before brows became a thing, mascara was absolutely the most important part of my routine. Mascara just makes you look so much more awake as it really opens up your eyes. As you experiment with makeup more, you’ll figure out if you like mascara that’s lengthening, thickening, or that separates your lashes. This is actually the mascara that I use every day (but I use the carbon black version because I like my lashes extra black). I wouldn’t say this mascara is exceptional in any of the three categories that I mentioned above, but it does all three very well. And it’s super lightweight and doesn’t flake off throughout the day. No one like black specks under their eyes! Also, I would recommend getting a water-soluble mascara instead of waterproof because waterproof mascaras can be really difficult to take off. You could end up losing some of your lashes trying to get it off! I do admit that I’m not much of a lipstick girl and I don’t wear lipstick on a daily basis. HOWEVER, there are times when I want to wear lipstick, and I’m glad I have a few go-to lipsticks in my collection! If you’re not used to wearing lipstick, I would recommend a lipstick in its traditional form – not a liquid lipstick. Liquid lipsticks are just slightly more difficult to apply and can be messier. This lipstick has a super creamy texture, which makes it easy to apply. It’s lightweight and doesn’t dry out your lips even if it’s matte. And it has a great color selection. Last, but not least, of the must-have section is setting spray! Some people might argue that it’s not a must-have product, but I totally believe it is! Using a great setting spray will extend the life of your makeup and it’ll add back some moisture into your skin if you used a lot of powder products. This setting spray will ensure that your makeup lasts all day with minimum creasing and fading. It also has a really nice nozzle – one of my biggest pet peeves is when sprays have nozzles that feels like you’re getting sprayed with a water gun! This one isn’t like that. As I said above in the foundation section, you can totally use your foundation as a spot concealer by adding a bit more in the area you want to conceal more. So, a concealer isn’t totally necessary in your makeup starter kit. However, if you’re looking to highlight areas of your face – like brightening up your under-eye section, you’ll need a concealer that is a lighter shade than your foundation. This concealer is part of my everyday routine, I love it so much! It’s really creamy, easy to blend out, and it has pretty good coverage. I would call it a medium-full coverage concealer. My favorite part about this concealer is that it’s great if you have sensitive skin. When applying concealer on my under-eye area, it’s such a sensitive area that my skin often starts to sting. But, not with this concealer! Because it’s safe for me to use around my eyes, I also use this concealer as my eyeshadow primer. If you’re not covering your full face with a ton of cream/liquid foundation and concealer, you can totally just use a pressed powder to set your face, like the powder foundation I mentioned above. However, if you apply full-glam, full-coverage cream/liquid foundation and concealer to your face, it’s super important to set everything with a loose powder! This ensures that it stays in place, doesn’t separate/crease, and that it lasts as long as it possibly can. And I’m the type that likes my face to be dry to the touch, so I pack on the loose powder all over my face. This also makes it more transfer-proof! Don’t you hate when your makeup gets on your clothes? Applying loose powder lessens the chances of this happening. This stuff is honestly the best. I use it every single day to set my makeup and it’s a total dupe for the fan-favorite Laura Mercier Translucent Setting Powder. The only difference is that there are shades to the Maybelline powder, so make sure to get the right shade! For reference, I use the shade Fair 05. As I mentioned earlier in the post, bronzer was never part of my must-haves until recently. Now everything is a must-have for me LOL. Bronzer is great for warming up your complexion and putting back some color into your skin after your foundation. It can also be used as a light contour! This is such an amazing bronzer because it’s not too warm-toned nor is it too cool-toned. Unless you’re at the end of either side of the shade spectrum, the original shade of this bronzer (the shade name is ‘Bronzer’) is a great starting point. They now have other shades to suit other skin tones as well! Contouring is totally not necessary when you’re just beginning on your makeup journey for the same reason that concealer to highlight isn’t necessary. In both cases, we use these products to sculpt our face – essentially using different shades to add dimension and create illusions of shadows. Two shades are included in the palette – one for highlighting and one for contouring – for a REALLY affordable price. The powders are great quality as you get a good amount of color payoff, but it’s still able to blend out seamlessly. Alright guys, here’s the truth: highlighter is totally one of MY must-haves, but in actuality, it really isn’t all that necessary to wear on a daily basis. Yes, I totally love how it seems like the sun is reflecting off the high points of my cheekbones at all hours of the day. But, I understand that it’s extra AF. And not everyone is as extra as I am. However, if you want some highlighter recommendations, I’m the girl! Both of these highlighters will give you glow for days! You’ll be able to see your highlight from outer space! Each comes in a variety of shades and many of them are beautiful. My personal favorites are Molten Gold and the NikkieTutorials shade in the Maybelline MasterChrome. And Golden Flower Crown in the Wet n Wild MegaGlo. This is the perfect ‘I just want to accentuate my cheekbones but still want it to look natural’ kind of highlight. I actually use it all over my face as a finishing powder for an all-over glow LOL but I’m full glam all day every day. If you like natural makeup that just enhances your best features, you’ll love this highlighter. This is another product that I rarely use (I do have it in my collection though). I just really can’t be bothered taking the time to do a winged liner! How many of you can relate?! Of course, there are other types of liner styles you can do – not just winged. But for those styles, a liquid liner isn’t really necessary. You can achieve the look with eyeshadow or a pencil liner. But, if you do want a liquid liner and haven’t played around much with liquid liners before, I would definitely recommend a brush tip pen liner. This liner pen has a super precise pointed brush that makes it easy to maneuver across your lash line. The color is very pigmented, and it lasts all day! No smearing or fading. I personally love to apply liner to my waterline because it really makes my eyes pop. But of course, if you’re not comfortable with having a pencil that close to your eyeball, I would totally skip it. However, you can also line your upper lash line with a pencil liner to add definition and created the appearance of a fuller lash. I don’t recommend doing a wing with a pencil just because it’s hard to get super precise. In addition, eyeliner pencils are great for creating smoky eye looks. You can apply the liner and smudge/blend it out with a dense brush. First of all, it’s retractable! You’ll never have to worry about sharpening it. And retractable pencils are usually softer in texture than traditional pencils, so they are more comfortable to apply. These pencils have amazing pigmentation and it stays put! Even on the waterline, there is minimal fading and smudging. Whenever I wear lipstick, I’ll line my lips first to define the outline and to make sure I color inside the lines LOL. But, if you’re comfortable wearing lipstick without it, go for it! It’s totally unnecessary. Some say that it helps keep the lipstick from bleeding out of the lip line into the fine lines around your lips, but I have never personally experienced lipstick bleeding out. BUT, if you have, I’d give lip liner a shot. These lip liners are amazing! (Seems like NYX just does a really good job on liners, huh?) I use these pencils whenever I’m wearing lipstick and I’m never disappointed. They glide on smoothly, don’t bleed, and don’t wear off! I’ll often be left with just lip liner on after eating all of my lipstick LOL. And that’s it for this drugstore makeup starter kit! I hope it was helpful to you as you start your makeup journey! If you plan to go shopping for any of these products, download and print a free list of this post! Click image or button below image to get yours now! Let me know how it goes if you try out any of these products!